Built in the 1800s by the Spanish Empire, the Misión San Antonio de Valero housed missionaries and their Roman Catholic converts until the Spanish military stationed a cavalry unit there. The soldiers occupying the mission soon began calling the site “The Alamo” after the Spanish word for “cottonwood,” or poplar tree. Later, rebels and then the Mexican military were based at the Alamo until 1835 when the Texas Revolution began after land and tax disputes between settlers and Mexico. The Battle of the Alamo began after Texian settlers ran the military out of present-day Texas and took over the mission. In order to regain the Alamo and therefore Texas, Mexican President Antonio Lopez de Santa Anna organized an attack on the mission, which soon became the most famous battle of the Texas Revolution. Led by William B. Travis, James Bowie, a renowned knife fighter and David Crockett, a frontiersman, the 155 settlers defended the siege of 4,000 soldiers on the Alamo, but were defeated after 12 days by the sheer size of Santa Anna’s army. Though all of the Texians died defending their freedom — their “Victory or Death” mentality sparked the forthcoming revolution. The Alamo is more than a building. It’s a symbol of the Texas Revolution with a rich, 200-year history. Now let’s see what you know, with the quiz below! Do you remember the Alamo? Find out how much you know about the historical site. The Alamo is a historic mission. 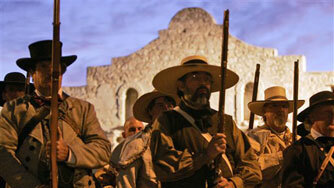 For 70 years the Alamo housed missionaries and their Indian converts. The original name of the Alamo was Misión San Antonio de Valero. True. The original name of the Alamo was Misión San Antonio de Valero. Where did the phrase “Remember the Alamo” come from? It was the final phrase many missionaries used to help convert people to Roman Catholic faith. It was the movie slogan for the 2004 film, "The Alamo," with Dennis Quaid and Billy Bob Thornton. It was a battle cry used by bitter Texans after a massacre by Mexicans at the mission. It was a battle cry used by bitter Texans after a massacre by Mexicans at the mission. Some attribute the phrase to an address by General Houston before the Battle of San Jacinto. Who fought in the battle of the Alamo? The Battle of the Alamo was fought by Texas settlers and the Mexican military. It was the most famous battle in the Texas Revolution. Which one of these men did NOT defend the Alamo? David Bowie did not help defend the Alamo in 1836. Yet, he did defend the goblin kingdom in the 1986 fantasy film Labyrinth.